Hello Friends!! I thought I would quickly pop in and say "hello!! "...and to remind all of you local knitters or those of you planning on visiting the area, that Fibrations is just a little over a week away! I'm still madly preparing (re: frantically sewing and trying to put together a booth) as much as I can in the limited time that I have. I thought I would have plenty of time to dedicate towards bag production but sadly these past few weeks have been directed to family matters. Oh well, c'est la vie! Anyhoo, back to Fibrations. In case you didn't know, Fibrations relies a lot on fundraising and the local community to get the event running. To keep the costs low for vendors and artists alike, a fundraising raffle is held on the marketplace grounds with prizes donated from every booth. It's pretty obvious what my donation is going to be. But in hopes of helping the event receive more funding I decided to step it up a few notches! Since I don't know if the winner of my prize prefers a zippered box bag or a drawstring project bag, I thought I would cover the bases and include both styles in my donation. And to make it feel more like a "set", I thought I would throw in a simple zippy pouch that can be used for pretty much anything - notions, make up, hexipuffs...heck, I sometimes use this little bag to hold a plain vanilla sock WIP when I need something small to tote around! 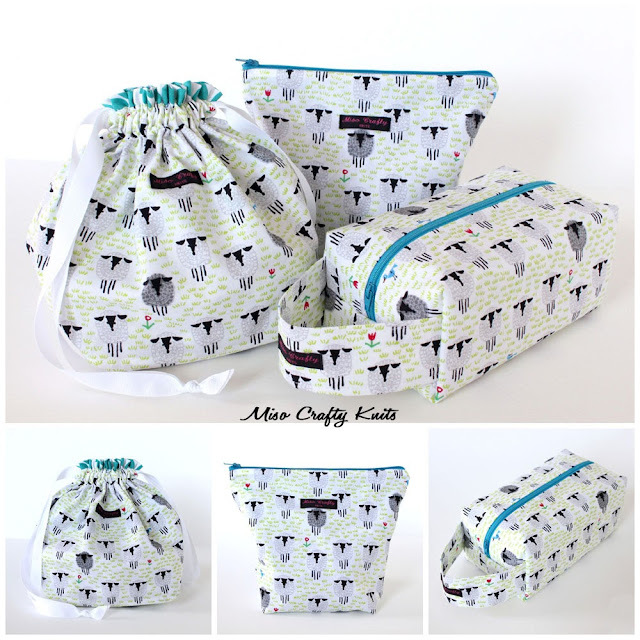 And since I wanted the set to appeal to as many knitters, crocheters, spinners, fibre artists, and people in general, I thought it would be pretty safe to use adorable sheepy print fabric. Cause yes, I know not every one loves pink, or even skulls, as much as I do. And not every one is into girly-girly fabric or anything overly cutesy. But sheep? Who doesn't like sheep?? Especially when there's a black sheep thrown into the flock (and yes, a group of sheep is actually called a flock according to this website)? Wouldn't you want to win this set? I mean, that's THREE projects that you can put in those bags! Three!! 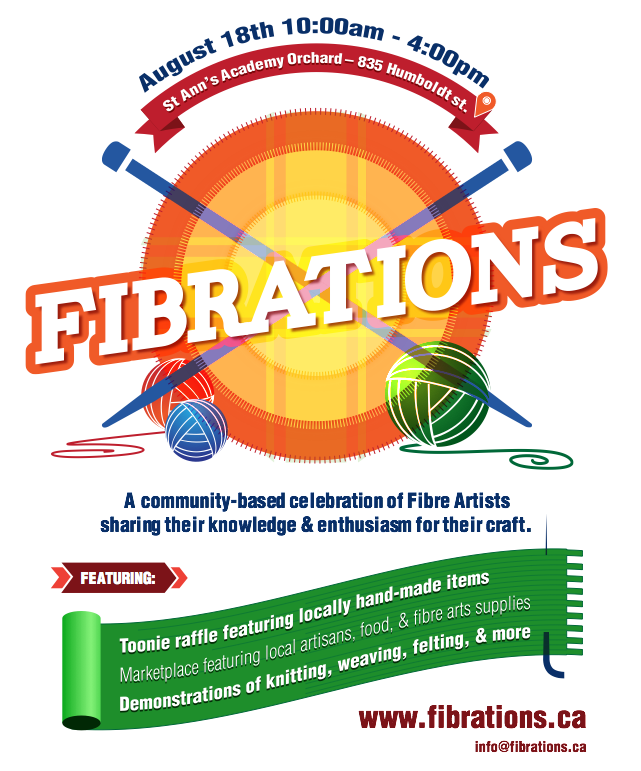 So if you're going to be in the 'hood, definitely stop by Fibrations - admission is free!! You can win this sheepy set for a mere $2!! Yep. That's TWO DOLLARS. Canadian. And while you're there, check out the rest of the prizes (I've definitely got my eye on a few!). For more information about the event and for a complete list of vendors, check out the Fibrations website. For more information about the donation prizes, check out the Fibrations Facebook page. Thanks Rebecca!! :) I'm hoping it'll be enough to "pull my weight" and get in a decent amount of funds for the event! Beautiful! I'm sure a ton of people will donate for the chance to win this. I also hoping you'll be bringing drawstring bags to Knit City as well. Thanks Chantel! :) You bet I'll be bringing drawstring bags to Knit City too!! If anything, I think I have more drawstring bags at the moment than I do box bags!